W. A. Mozart (1756-1791): An aria of Donna Elvira from the opera Don Giovanni. L. van Beethoven (1770-1827): Symphony no. 7, I movement, bars 1-53. A. Bruckner (1824-1896): Symphony no. 8, II movement, bars 1-61. G. Mahler's (1860-1911): Symphony no. 1, IV movement, bars 1-85. To gather takes from all recorded instruments and to form an ensemble playing together, some editing was required. In the first editing stage, one complete take was joined from several clips, if necessary. A common task was to replace accidental wrong notes in otherwise good take. All editing was performed in sample-accurate manner, thus the length of resulting files were kept unchanged. Second editing stage was essential for correcting any timing inaccuracy between the instruments. First imported parts in each passage were edited by using the piano track as a timing reference. These parts included usually some string instrument parts and a wind instrument. Timing inaccuracies were corrected. After the first completed parts, the piano track was muted and the actual instrument recordings were used as timing reference from this point forward. The goal in editing was not to create an unnaturally accurate synchronization. Therefore slight timing discrepancies were left unchanged. However, all the corrections were attempted to accomplish in a delicate manner so that the edits would not be easily perceived even by listening individual tracks. 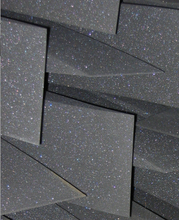 Auralization is a technique in which an anechoic stimulus is convolved with a modeled or measured impulse response of a space so that the listener can have a binaural listening experience . In other words, with auralization the acoustics of a certain hall can be simulated and listened to. Here are example auralizations, computed with the recorded anechoic music as stimuli. The concert hall model is a model of Sigyn hall, located in Turku, Finland. 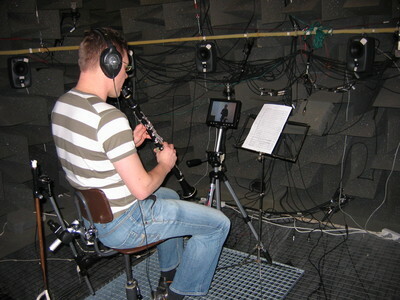 The room acoustic modeling is performed with the image source method + late reverberation. For each omnidirectional source point upto 3rd order reflections are modeled and late reverberation (T60 = 1.8 sec) is rendered with an artificial reverberation algorithm. For more information about the implemented auralization, see [2,3]. The following examples in three different listening positions (green rectangles, source positions are indicated with red) are binaural renderings. Kleiner, M., Dalenbäck, B.-I., and Svensson, U.P. 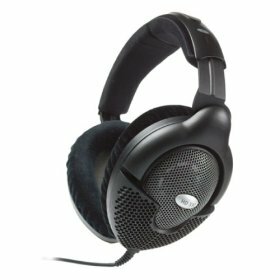 "Auralization - An overview", Journal of the Audio Engineering Society (JAES), vol. 41, no. 11, pp. 861-875, Nov. 1993. Savioja, L., Huopaniemi, J., Lokki, T., and Väänänen, R. "Creating Interactive Virtual Acoustic Environments," Journal of the Audio Engineering Society (JAES), vol. 47, no. 9, pp. 675-705, Sept. 1999. Lokki, T., Physically-based Auralization -- Design, Implementation, and Evaluation Doctoral thesis, Helsinki University of Technology, Department of Computer Science and Engineering, Telecommunications Software and Multimedia Laboratory, Report TML-A5, 2002. This project is funded by Academy of Finland (Project nr. 119092).